In January 1954, months after the end of the Korean War, U.S. soldiers held in POW camps were at last free to return home. 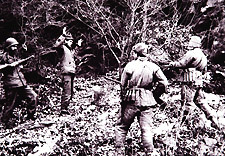 A small group, however, refused repatriation to the U.S. and, after being given 90 days to reconsider their decision, 21 American soldiers decided to stay in China. In THEY CHOSE CHINA, Academy Award-nominated Chinese documentarian Shuibo Wang tells the controversial story of these forgotten American dissidents. Using rare archival footage, excerpts from American and Chinese TV programs, as well as period and contemporary interviews, THEY CHOSE CHINA chronicles the fascinating history of this group of young Americans who were hailed in China as "peace fighters" and denounced in America as "turncoats" and "traitors." 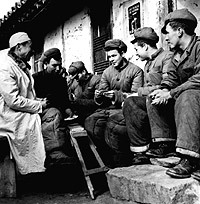 U.S. media claimed that these young POW's had been "brainwashed" by the Chinese communists. The film shows conditions inside these Chinese camps, featuring never-before-seen footage, plus contemporary interviews with some of the camps' Chinese translators, instructors, lecturers, and officers. The majority of the 21 Americans became disillusioned and returned to America, where they recanted their statements and were imprisoned by the military. Others remained in China, got educations, worked in a variety of jobs, married and raised families. In interviews today, several of the surviving men—including those who remained in China and those who returned to the U.S—along with members of their families recount their unusual experiences, explain their thinking at the time, and the nature of their beliefs today.